Preheat the oven to 425°. In a large pot of salted boiling water, blanch the carrots until barely crisp-tender, about 2 minutes. Drain and pat dry. In a medium roasting pan set over a burner, heat the oil. Add the carrots and cook over high heat, stirring once, until lightly browned in spots, about 5 minutes. Meanwhile, in a small bowl, mix the miso with the butter, brown sugar and half of the scallions to form a paste. Add the miso butter to the carrots and toss until coated. Roast the carrots for about 20 minutes, stirring once, until tender and glazed. Stir in the remaining scallions. Transfer the carrots to a bowl and serve. 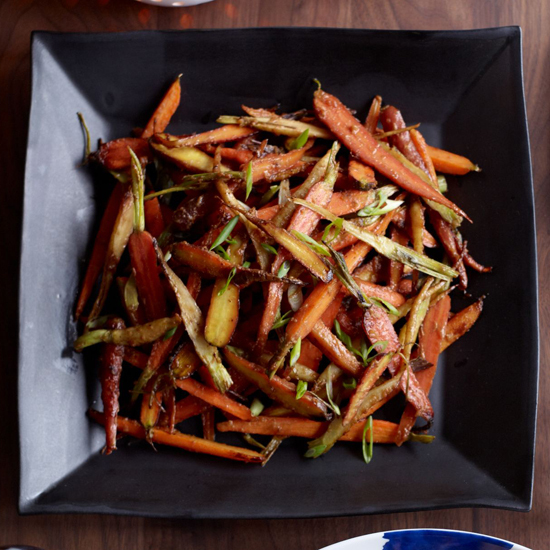 The roasted carrots can be refrigerated for up to 2 days.